The actions against Homekeeper and Budget Maid stem from a misinterpretation of the Al Jazeera report. The article suggested that “some” agencies “display women at work” in a manner that might have been degrading, and that there had been some complaints of women being poorly treated at certain agencies. However, it did not specifically allege Homekeeper and Budget Maid of mistreating their employees. Another aspect of the report – the practice of “live-training” at shopping centers – has been downplayed by various groups. In an article published on the 3rd of July in ‘Today’, a Singaporean daily, the Association of Employment Agencies (AEAS) dismissed suggestions that domestic workers were being displayed inappropriately. The ‘Today’ article also referred to a spokesperson from Singapore’s Ministry of Manpower (MOM), who visited both shopping centers mentioned in the report, but who did not “find any inappropriate displays” of domestic workers. This article responds to those claims by reiterating some of the main points of the Al Jazeera report. 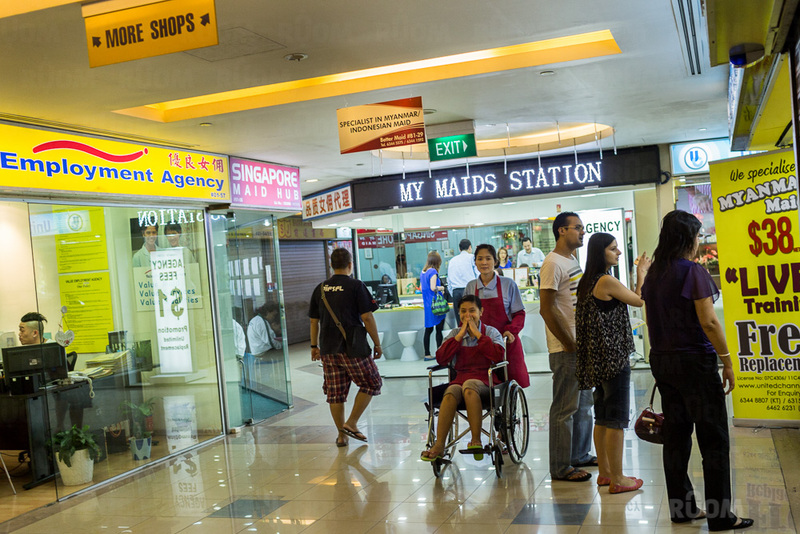 At Katong Shopping Centre, RUOM documented a domestic worker pushing her colleague in a wheelchair in front of her employment agency. She was, apparently, feigning to take care of an elderly person. This was done in full public display. Similar practices were observed at Bukit Timah Shopping Centre. The two domestic workers were members of “United Channel”, an employment agency in Singapore. At the entrance to the agency, a prominent sign advertises the company’s business. It “specialise[s] in Myanmar maids” and domestic workers from Indonesia. In addition, it offers a “discount” of “up to $500” and displays what it calls “live” training. Inside the agency, women can be seen tending to baby dolls and ironing clothes. Significantly, the Channel NewsAsia report did not interview any of the domestic workers at the employment agency. This omission is troubling. The experience of domestic workers is arguably the most important part of this story, and it is critical that their views are taken into account. It cannot be taken for granted that the employment agency accurately represents their views. On certain occasions, indeed, this is precisely what must be questioned. The Al Jazeera article generated much commentary on Facebook groups popular with domestic workers. The responses posted on the 2nd of July on ANIYSA and SHEG – two organisations which further the cause of migrant workers' rights – are particularly worth noting. Some women praise agencies where they have had positive experiences, while others criticize, in strong terms, their treatment at the hand of employment agencies. The responses are mostly negative and highlight a number of issues. Some women claim that they were not given enough food by employment agencies, while others say they were not properly accommodated. One woman recalls sleeping in a kitchen, and claims that she was made to “do all the cleaning” at the house of her agent. While some respondents remember their agencies being “kind” and “very good”, three respondents on the ANIYSA website recalled the feeling of being treated like “slaves”. One domestic worker remembers “bargaining myself to get [a] new employer”. She was referring to her time at a shopping mall as a “transfer” maid. Before coming to Singapore, all domestic workers undergo mandatory training in their home countries. In Indonesia, for instance, training takes 600 hours to complete. At centers women not only learn basic skills such as cooking, ironing, and cleaning, but are also trained in the care of infants and elderly people. “Live-training” in Singaporean shopping malls might therefore seem superfluous to many of these domestic workers. It may also give the impression that women are learning new skills, when in fact they are repeating skills they already have. The Al Jazeera report suggested that this practice was a particularly degrading experience for many women. Not only was the work repetitive and monotonous, it was also conducted in public view. In the ‘Today’ article, the AEAS defended this practice, and characterized the rooms as facilities for “training”. The Ministry of Manpower was quoted as saying the practices were not “unreasonable”. Upon coming to Singapore, many domestic workers benefit from learning about cultural differences in the country, and safe methods for performing household work. These forms of training are important and necessary, and are provided by many agencies in private settings. But NGOs say that “live-training” in public areas is a source of concern. Shelley Thio at TWC2 went so far as to say the “live training is a form of abuse”. She said that some agencies put up “notices and sign boards that display sexist and degrading language, carrying such words as "fresh" maids, "first-timers", [and] "free replacement maids"”. She mentioned the humiliating experience of being “put on display”, and added that “some agencies make the women cut their long hair, to make them look unattractive”. The “discrimination is both classist and patriarchal”, she said. When Ummai Ummairoh, a domestic worker interviewed in the original report, said that some women are made to “look like dolls at a supermarket”, she articulated an experience of objectification – of being seen, appraised, and evaluated. This is a different narrative from employment agencies who say that the women are “happy” in “doing [this] training”. The environment of these malls – the signs, the language, the “live-training” – is part of a culture in which many domestic workers are objectified. “Any business person has the right to offer a discount,” Ms Jayaprema was quoted as saying in ‘Today’ on the 3rd of July. The thrust of the Al Jazeera article was not to question this but to highlight the manner in which particular promotional offers are made.